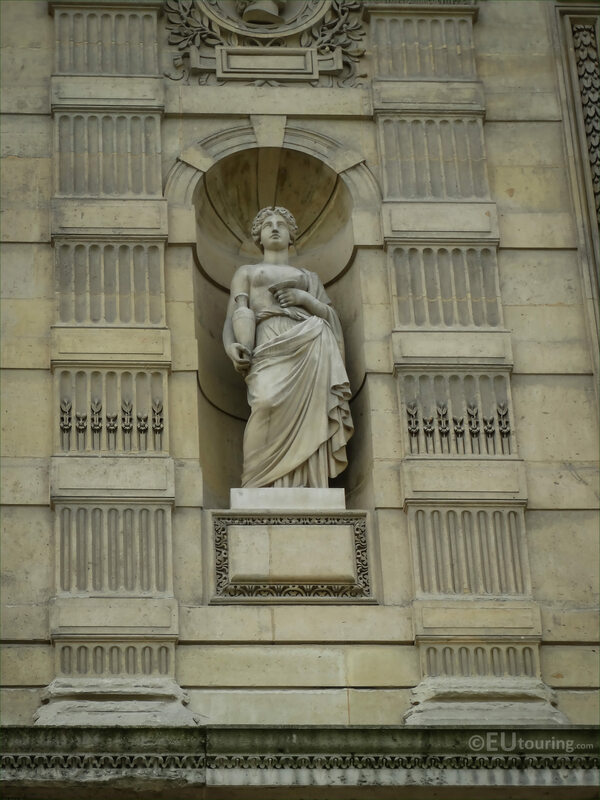 Again we were in the courtyard called the Cour du Carrousel of the Musee du Louvre admiring the Aile de Flore facade, when we took these high definition photos showing a statue called Hebe the Goddess of Youth, which was sculpted by Eugene Andre Oudine. As you can see from this first HD photo showing the statue of Hebe, it is located within a niche on the facade of the Aile de Flore wing of the former Palais du Louvre, and when you are standing in the courtyard looking at the facade, this is positioned on the second level sixth from the right hand side. 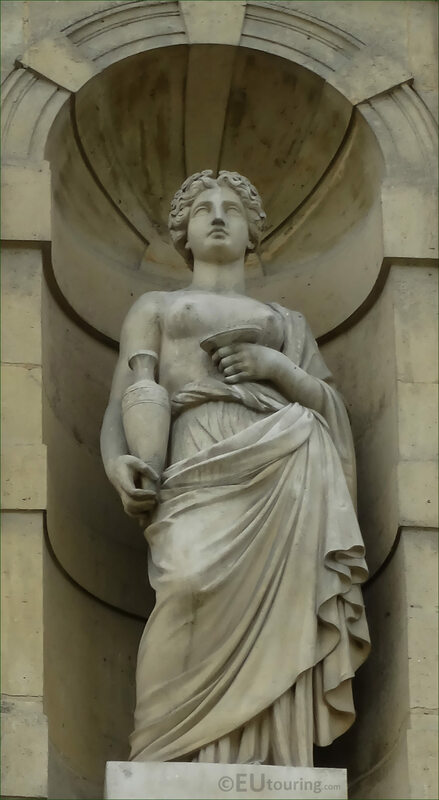 Now in Greek mythology, Hebe is the Goddess of Youth and was known as a cupbearer for the gods and goddesses of Mount Olympus, which is why she has been portrayed in this allegorical statue holding a cup in her left hand and a vessel for holding drink in her right hand, and she was supposed to have the power to give eternal youth. And this allegory depicting Hebe was produced by Eugene Andre Oudine who was born in Paris in 1810, becoming a French medallist and sculptor, taking the Prix de Rome for engraving in 1831, which is what he mainly dedicated his work to, designing medals for the French Mint. However, Eugene Andre Oudine also excelled at sculpture producing several portrait busts and monumental statues like the one of the Goddess of Youth, which you can see in this close up image, along with one of the series of queens for another popular tourist attraction called the Luxembourg Gardens, but passing away in 1887, he is still mainly recognised as the father of the modern day medal.